Definition Causes Is It Uncomfortable? What Does It Mean? What is the death rattle? If you are caring for a loved one in the last days of life you may be distressed after reading about the death rattle. Or instead, you may be hearing frightening sounding breaths and wonder what it means. Let's talk about what the death rattle means, whether it is bothersome for the person who is dying, how it affects loved ones, and how it can be treated. While the death rattle can be very hard for family members to listen to, it is a normal end-of-life event that is not uncomfortable for those who are dying. It may be hard to believe that the death rattle is not uncomfortable for a person, especially when it occurs in a person who is awake or semi-conscious. 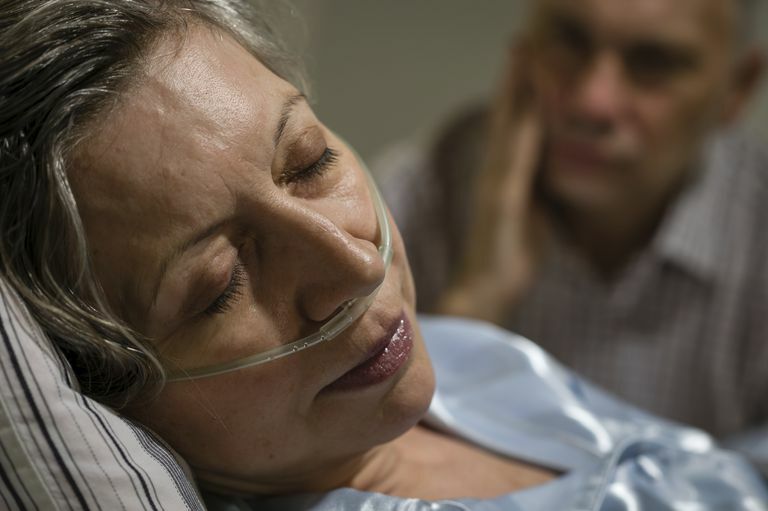 Studies have found repeatedly, however, that the death rattle is not uncomfortable Studies have found that people who experience a death rattle while dying do not have any difference in respiratory distress than those who do not have a death rattle. Likewise, the severity of the death rattle (how loud and uncomfortable it sounds) does not correlate with the amount of respiratory distress a dying person is experiencing. In contrast to the dying person, however, the death rattle can be very uncomfortable for loved ones who are present. In one study, at least 66 percent of loved ones of a person dying found that listening to the death rattle is highly distressing. If family members are distressed, there are medications that can be used to dry up some of the excess secretions that contribute to the death rattle. It's important to state again that research has concluded that the death rattle is not something which is uncomfortable or frightening for the person who is dying. It is a normal and common part of the dying process, and your loved one does not feel like she is suffocating when she breathes this way. In addition, the antisecretory agents that are prescribed for the death rattle do not often decrease the sounds. Having an awareness that the death rattle is common and not uncomfortable is probably the best treatment. The death rattle likely means that death is very near and that the body has begun to shut down. While in the past we thought of death as "just happening" we are now learning that death is an active process—the body goes through a number of steps in its process of shutting down. Most often, when a death rattle is heard a person is in their last hours of life. Medications for Secretions - If you have a hospice comfort kit you will note that there is a medication for drying up secretions which may help. This is usually either atropine or scopolamine. Changing your loved one's position - Often simply rolling your loved one over a bit can reduce the rattle which is often more pronounced when patients are lying flat on their backs. You can also try elevating their head and turn it to one side to help drain the secretions. Many people wonder how long it will be until death when someone develops a death rattle. Unfortunately, it varies a lot from person to person making it hard to predict exactly what the rattle means to you specifically. You may be wondering what else you can expect in the final stages of death. Something called terminal restless is common at this time, and your loved one may appear very restless. There is also the concept of near-death awareness and she may tell you she is dying. Many people at this point speak of seeing loved ones who have died before, and some people even begin to smile. Don't try to correct your loved one, just love her. Being with your loved one while they are dying is incredibly challenging, but is the most loving thing anyone can do for a loved one. When people talk about their greatest fear in life, it is often that they will die alone. Your presence is the greatest gift you can ever give. Yet even with knowing that, it's important that you take care of yourself. Everyone needs a break once in a while, and in the setting of death, this is more important than ever. Don't stop talking to your loved one. It's thought that hearing is the last sense to disappear, and even if she appears deeply comatose, she may still sense your presence or hear what you are saying. You don't need to say anything in particular—just let her know you are present. Some people fear to take a moment for themselves because they are afraid that their loved one will die while they are gone. Take care of yourself as your loved one would wish. In fact, it seems that some people wait for a moment when their loved ones step out to take their last breath. The death rattle is only one aspect of dying which is helpful to understand long before it occurs. You may be interested in learning about how to prepare for death in your own home. Campbell, M., and H. Yarandi. Death Rattle is not Associated with Patient Respiratory Distress: Is Pharmacologic Treatment Indicated?. Journal of Palliative Medicine. 2013. 16(10):1255-9. Lokker, M., van Zuylen, L., van der Rijt, C., and A. van der Heide. Prevalence, Impact, and Treatment of Death Rattle: A Systematic Review. Journal of Pain and Symptom Management. 2014. 47(1):105-22. Shimizu, T., Miyashita, M., Morita, T., Sato, K., Tsuneto, S., and Y. Shimo. Care Strategy for Death Rattle in Terminally Ill Cancer Patients and Their Family Members: Recommendations from a Cross-Sectional Nationwide Survey of Bereaved Family Members’ Perceptions. Journal of Pain and Symptoms Management. 2014. 48(1):2-12.